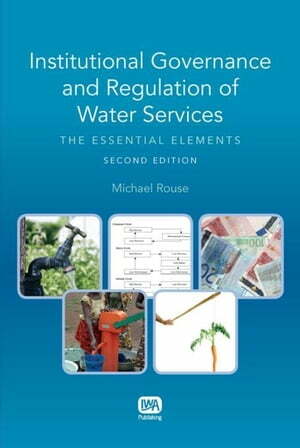 Collins Booksellers - Institutional Governance and Regulation of Water Services by Rouse, Michael J., 9781780404516. Buy this book online. Institutional Governance and Regulation of Water Services aims to provide the key elements of policy, governance and regulation necessary for sustainable water and sanitation services. On policy matters, it covers important aspects including separation of policy and delivery, integrated planning, sustainable cost recovery, provisions for the poor, and transparency. Regulation and Regulatory Bodies are presented in their various forms, with discussion of why some form of independent scrutiny is essential for sustainability. The focus is on what works and what does not, based on consideration of basic principles and on case studies in both developing and developed countries. The early chapters discuss the key elements, with later chapters considering how these elements have come together in successful reforms of public sector operations. A chapter is devoted to the successful use of the private sector based on lessons learnt from 'failures' of private contracts and the need for the application of sound procurement principles. The current trend is for a public sector model which benefits from business approaches, the so-called corporatised public utility. Experience since the publication of the first edition in 2007 reinforces the importance of the key elements for sustainable water services.